Around the world, black handprints are appearing on doorways, scorched there by winged strangers who have crept through a slit in the sky. In a dark and dusty shop, a devil's supply of human teeth grows dangerously low. And in the tangled lanes of Prague, a young art student is about to be caught up in a brutal otherwordly war. Meet Karou. She fills her skecthbooks with monsters that may or may not be real; she speaks many languages - not all of them human; and her bright blue hair actually grows out of her head that color. Who is she? That is the question that haunts her, and she's about to find out. Daughter of Smoke and Bone was one of the most buzzed about books late last year. And I completely understand why. This book is like nothing I've ever read before. Seriously. I've said that a few times in reviews, but this book is so unique it negates me ever using that phrase. I really wasn't sure that to expect when I picked the novel up, and even if I had a guess, it never would have been able to describe Daughter of Smoke and Bone. This book was filled with the fantastical, and I was completely fascinated by it. All the different creatures, each with their own motive and plotline, kept the story flowing and kept my eyes darting across the page. I was desperate to find out the mystery surrounding Karou, and what Brimstone did with all those teeth. I wanted to find out as much as I could about Elsewhere, and was on the edge of my seat waiting for the other shoe to drop. I loved the characters in this book. Karou, Brimstone, and Akiva particularly found a special place in my heart with their courage and strength. All the characters were very layered and unusual (many of them being mythical monsters) but they all still maintained an essential human element. For some it was pain, others it was revenge, and for a select few it was hope. And that little pocket of hope was one of the brightest, and most inspiring things in this novel. Hope made this dark, wicked tale glow. The one real issue I had with the book was how dense it was. There was a TON of information thrown at you in this first installment, which is understandable. The world Karou lives in is a mix of Elsewhere and reality, and there's lots of complexities to it. I found that the information went on overload during the middle, and had me blinking in bewilderment. I also was not a fan of the shift in the last half of the story. I understood the need for a developed back-story, but I felt that it was much too long and unnecessarily detailed. It really cut the flow of the story for me, and although I enjoyed having many questions answered, it felt choppy and left me unsatisfied. Now, that's not to say I didn't like the story. I loved it actually. Such a new, fresh, creative idea that swelled with enchantment and wonder. 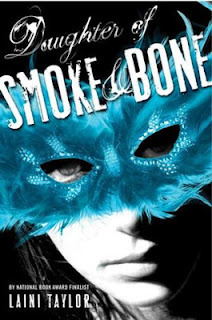 Laini Taylor is a brilliant novelist, and her world created in Daughter of Smoke and Bone is a testament to her skill. I want to be wrapped back in that world as soon as possible (hopefully without the confusion this time). Overall, this is a strong book that wobbled slightly near the end, but packed a powerful punch of creativity and passion. I cannot wait to get my hands on the sequel, and to dive back into a world of faery tales, monsters, and that persistant little thing called hope.